Use:One of the hormones produced by the thyroid gland that is involved in the maintenance of metabolic homeostasis. Also produced in peripheral tissues as the active metabolite of Thyroxine. Pharmaceutical raw materials. 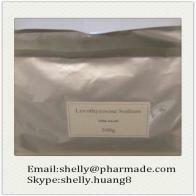 Our company is specialized exporter, manufacturer and supplier of Levothyroxine Sodium T4 Raw Material Powder in 中国.